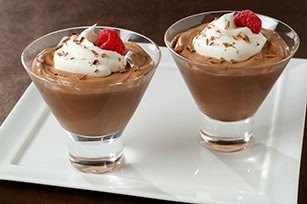 Chocolate Mousse recipe is very tasty and easy to prepare.you can prepare it within less than 4 minutes.I give u a simple recipe by following which you can prepare it easily. Mix custard powder, sugar and water in a deep bowl till smooth. Microwave it for 2 minutes.Stir once a microwave again for 1 minute to get a thick sauce like consistency. Add a chocolate pieces to the hot sauce and stir well till smooth. Microwave soaked gelatine for 30 seconds. Pour hot gelatine mixture in the hot chocolate mixture. Stir well to mix. Keep aside to cool. Beat cream till fluffy. Add cream to the cooled chocolate mixture. Put in glasses or a serving bowl. Keep in the refrigerator for 3-4 hours to set. Decorate with chocolate, cream and glace strawberries.